Generally macro evolutionary stories have the following elements. 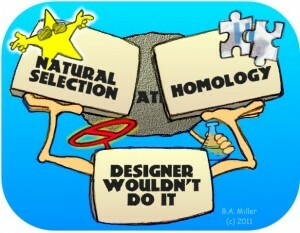 Natural selection is used to represent the full process of evolution, homology helps create the evolutionary sequence, and then the idea that a designer wouldn’t create the feature being examined is used to give credence to natural selection and homology. Meanwhile, mutation is usually left out of the story because it falsifies, contradicts or complicates the storyline. The comparison of similar characteristics is used in conjunction with fossil dates to create the evolutionary sequence. The actual mechanism for change is irrelevant to homology. Meaning homology only helps to overlay sequences on the data; it does not demonstrate the process that caused the similarities. Intelligent design or evolution can result in similar structures and sequences. Since homology doesn’t actually demonstrate the process, to use it as evidence for evolution is circular reasoning. It evolved because it looks similar, it looks similar because it evolved. Repeat until convinced. When similarities are not due to relationship it is called convergence. Similarities listed as convergence number in the thousands and range from the molecular level to ecological services. Many of these are well-known discrepancies and have representation in every lineage. Rather than seeing these as problems evolutionists conclude that this is the way evolution works. Again, this is circular reasoning. Evolution creates convergence, therefore convergence is evidence of how evolution creates. Lining things up in a sequence creates problems when you’re trying to force an imagined sequence on the data, therefore there is lots of debate in all sequences of macro evolutionary lineages. Natural selection is presented as a reason for the existence of the characteristics. Of course natural selection on its own can do nothing. It is neutral to origins. It only “selects” those things that already exist; therefore it cannot explain their origin. Intelligently designed features can also be selected through natural selection. So the fact that a feature is or was selected does not exclusively indicate an evolutionary origin. Natural selection is also a truism. Everything that has ever existed more than one generation has been selected. Every feature on every organism contributes in some way to its selection. Another term for natural selection is survival of the fittest. This becomes tautological or circular when used as evidence for evolution. It survived because it was fit, it was selected because it survived, and therefore it was fit and was selected. It seems to make sense because an organism that is selected will also survive, for a period at least. But natural selection has nothing to do with the origin of the changes, nor is it proof that the needed changes occurred or can occur. As evidence for evolution natural selection is not the critical part of the equation. Yet it is almost always credited as being responsible for any feature. What makes it useful is that it can be applied to any organism without knowledge of the process or steps that caused the selected features to arise. Because both natural selection and homology are weak arguments and tend to avoid and mask problems, bad or unlikely design is used to prop them up. When doubts about the power of natural selection or surprises in relationships due to similarities occur, bad design is used to lower the incredulity response. The argument is that if a design is sub optimal evolution must have done it. But this argument ignores several factors. 1. Over time mutations can make a good design sub optimal. 2. Designs are said to be poor without presenting evidence that a better design is possible or that a better design has been tested in the same conditions. Just suggesting a better design doesn’t cut it. 3. Ideas of optimal design are subjective. 4 When evolutionists look at the systems in life they very often refer to the features in life as exquisitely designed and seek to copy them. That is, the “bad design” argument is not coming from an examination of the system as much as a need to support an evolutionary storyline. 5. The perception of problematic features can come from a lack of understanding of the full function or a misunderstanding of the system requirements. Remember, biology is actually high tech. Millions of mind hours have gone into the level of understanding that we have now. If evolution is true then mutation is ultimately its source for raw material. Yet, because of the nature of mutation, there is no place where it can be presented in a positive light. But, everything that exists, if it evolved, must be the result of many coordinated mutations. Experiments have demonstrated that the kind of mutations needed to drive evolution are not rare at all, they simply don’t occur. Additionally the number of mutations needed to create a new functional system are enormous. Evolutionists never demonstrate how mutations can build systems because it is fraught with too many unsolvable problems. When mutations are mentioned it is within the context of micro-evolutionary change. That would include gene duplication, lateral gene transfer, gene co-opting, point mutations and loss of genetic function. All of these can have definite effects on fitness, but they don’t represent the origin of coordinated, system building code. Evolutionary stories pass peer review on these conditions because they don’t require proof that the biological part of evolution, mutation, be tested. Posted on April 1, 2014 by Brett MIler. This entry was posted in Science vs Evolution and tagged belief in evolution, convergence, evolutionary similarities, Homology, mutation, natural selection. Bookmark the permalink.